SCN: FSR celebrates its 28th year in business in 2009, and still makes all its products at its headquarters in West Paterson, NJ. How important has the ‘Made in the U.S.A.’ approach been to the company’s success? Jan Sandri: It has been extremely important. The first advantage we have is speed of development. We’ve always been fairly fast, but there’s more and more pressure to bring product to market faster now. We can be quick because we have product development and manufacture under the same roof. We don’t have that long lag of sending a design offshore and then having to wait for the finished product to come back. We can also monitor inventory very efficiently, and the amazing thing is that our products are the same price as, or cheaper than, those built offshore by some of our competitors. Finally, we can monitor quality here. If our staff sees a problem, we identify it immediately. We don’t do product recalls, because we just don’t need to. SCN: FSR manufactures more than 150 different products for a huge variety of applications. How do you divide everything up? JS: We have two main product areas. The first is metal floor boxes, wall boxes, table boxes, products that help with AV connectivity on these sorts of surfaces. The second area is electronics, everything from small distribution amplifiers and interfaces up to matrix and seamless switchers. 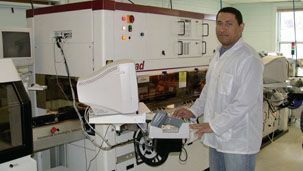 Production manager Ramon Cruz programming the company’s in-house QSP2 “Pick and Place” machine. project where there is some price pressure, we might get asked for a certain piece of equipment that essentially combines two or three pieces into one, and we are happy to do that, too. SCN: So you use customer feedback to directly influence engineering, first with the creation of custom items and then with new series products? JS: With a new product, there’s always a balancing act between how many features you put in and how quickly you can get it to the market. But then invariably you have the product out for a few months and customers want to add features to it—maybe a different way of controlling it. And it’s easy for us to make a software change or changes to the inputs or controls. We are able to do that because we are very flexible. SCN: FSR is very active in courting the architectural community, offering things like seminars aimed at educating architects and designers about the needs of AV. Yet many contractors complain that architects disregard their needs. What would you say to that? JS: Well, the architects are at the top of the food chain. They’re where a project begins, and where the creativity begins. They want any technology that’s in their building to look elegant, and they have a right to that. They need to know that this technology will fit in between floors and walls and tables. Our goal is to educate architects, to reassure them that all this technology can be built into buildings, while still having everything looking good. At the same time, while architects provide the building and structural design, it’s the AV consultants who provide the technology design, so it’s important that we have an open dialog with them as well. We have a very loyal customer base that is also very creative, and we want to keep it that way. SCN: Going forward, which areas of your business do you feel will experience the most growth? JS: We’re going to see growth in both metal and electronics. With the infrastructure that’s going into buildings today, the challenge for us is to come up with products that will handle an ever-wider range of signal types. But no matter what we do, we will always support our loyal customers and that way that we support them will not change. Our 24/7 tech support is managed by our own FSR technical staff—not just someone reading from a script.